Coinciding with Mrs. Betty Ford’s birthday, ‘America’s First Ladies: The Centennial Birthday of First Lady Betty Ford’ highlights the lasting impact and enduring legacy of one of America’s most beloved First Ladies. The April 11, 2018 luncheon was held at the Frederik Meijer Gardens & Sculpture Park in Grand Rapids, Michigan. 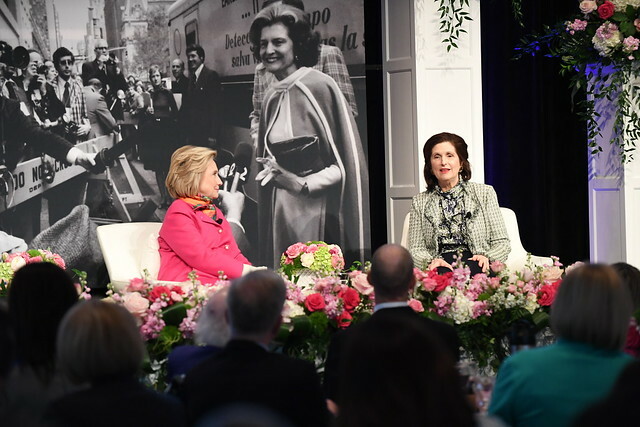 This year’s special guests were former First Lady and Secretary Hillary Clinton; Lynda Bird Johnson Robb, daughter of Lyndon and Lady Bird Johnson; and NBC Journalist Andrea Mitchell. Michael Ford and Susan Bales Ford, children of Gerald and Betty Ford, also attended. The event celebrated Betty Ford’s legacy on what would have been her 100th birthday. The Gerald R. Ford Presidential Foundation in partnership with the Gerald R. Ford Presidential Museum in Grand Rapids recently opened a new exhibit honoring Mrs. Ford. The exhibit “In Step with Betty Ford: A Celebration of Her Centennial” opened April 10, 2018 and will run through January 16, 2019. Liesel Meijer welcomed the audience before the panel discussion between Hillary Clinton and Lynda Bird Johnson Robb moderated by Andrea Mitchell. Grand Rapids Police Officer Wally Tett performed “What I Did For Love”, a favorite song of Mrs. Betty Ford. The invocation was delivered by East Grand Rapids Sudanese Grace Episcopal Church pastor, Rev. Zachariah Char. The Gerald R. Ford Presidential Foundation also showcased an honorary video tribute to Mrs. Betty Ford. Susan Ford Bales introduced the panel and reflected on the friendship that each of the panel participants had with her and Mrs. Betty Ford. She also recalled the day they all came to comfort the Ford Family during the State Funeral of Gerald R. Ford while they were staying at the Blair House near the White House. Andrea Mitchell began the panel asking Hillary Clinton about her image of Betty Ford. Clinton believed Betty Ford was one of the most transformational Americans in the last half of the 21st Century. Clinton highlighted First Lady Betty Ford standing out and campaigning for the ERA (Equal Rights Amendment) as well as Breast Cancer Awareness as marquee examples of what she meant to the country and how she worked to make the lives of women better. Lynda Robb recalled the days when she was a student at the University of Texas while having U.S. Secret Service protection. Robb also fondly remembered First Lady Betty Ford visiting her family’s home. She told the story behind one of the event photos, of when she joined her mother Lady Bird Johnson, Rosalynn Carter, and Betty Ford to campaign for the ERA at an event in Houston, Texas.